Animated series. When Dagur comes to Dragon's Edge looking for Heather, Hiccup tries to keep the two siblings apart by teaching Dagur the art of dragon riding. Browse content similar to Family on the Edge. Check below for episodes and series from the same categories and more! It was also our parents' nicknames for us. My nickname was Slow, which I thought was inaccurate. Viggo doesn't know we found his shipyard, yet. We'll only have one chance at knocking out his fleet. We have to get it right. Come on, bud. Let's get some shut-eye before dinner. Brother! Wait, where are you going? It's me. Where's my hug? I see you've been keeping busy. Hey, come on, Toothless. Where's the love, man? What the Thor are you doing here? Heather. I haven't seen a trace of her. -I've got to have a dragon. To find Heather, I need to cover more ground faster. Hiccup, you and Toothless owe me. You also tried to kill us. I think maybe in here, I never really wanted to. -I-I can't train you to ride a dragon. Well, you're too busy. I get it. Sorry. Guess I'll be going. No, no, no, no, no. You can't. on the far side of the island. That's where the best wild dragons are. Actually, you should go there right now and camp out for the night. Great idea. Thank you, Hiccup. You're so small and cuddly. Please never say that again. So, I'll see you later. Remember, on the far, far side of the island. But somebody better explain how yak stew got in my pants. you ever wonder what happened to Dagur and his crazy pants? And for the record, I don't think his pants were that crazy. What brings Dagur up, anyway? do you ever wonder why he helped Heather escape from Viggo? Probably as a distraction so he could get away himself. Maybe, but I don't know. A dragon doesn't change its markings, Hiccup. Except for a Changewing, yes, I know. Stoick the Vast, would ever learn to ride a dragon? I'll split the father-killer in two! OK, I think we get your point. I'd better go. I have island patrol tonight. I have a way more important mission for you. It's one final recon mission to check out our target. What are you talking about? We went last time. I know. That's why I'm sending you again. To be on the lookout for any last-minute changes. That sort of makes sense. And you should leave tonight. Tonight? But I haven't even packed. Ah! It's going to take a whole day to get there. Hiccup, are you trying to get rid of us? Yes... No, no. That's crazy. Sooner we leave, the sooner we get back. And by that I mean be safe. Finally! Not mad, just excited. I've been thinking about what dragon I should ride. Something that makes a statement. -You don't have any Skrills hanging around, do you? Well, I suppose I could settle for a Night Fury. Not the same zhoosh as a Skrill, but I could get by. Sorry, he's one of a kind. How about a Razorwhip? Like Heather's? Dagur, I actually already picked out a dragon for you. He's awesome, right? And dangerous? Because I already picked out a name. Is... Is this my dragon's breakfast? The perfect dragon for you. Yeah, I am not riding that dragon. Then you're not riding any dragon. Prove to me that you can even get on it. You made your point, Hiccup. We'll do it your way. Come on, Shattermaster. Turn! turn! Maybe we should try something a little more down to earth. You're trying to steer him too much. 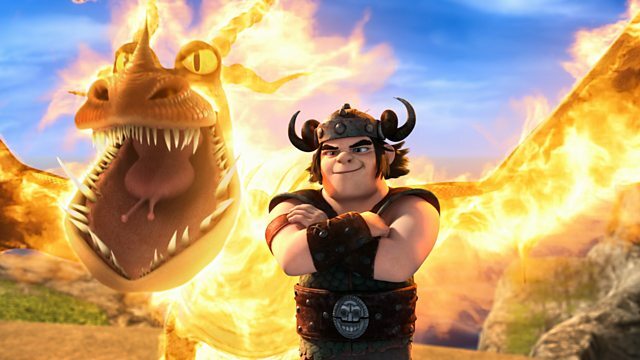 You need to trust your dragon, Dagur. He doesn't want to hit the trees any more than you do. Let's see what you've got for speed. Bad Dagur, bad! I'm sorry, Hiccup. You're trying to do too much too soon. I can't fly Toothless like this. Give me it. I can straighten it out. It's OK. I have a spare back at my hut. I'll take your dragon and be back as soon as I can. Now, you stay right here. Don't do anything. All right? Toothless, keep an eye on him. So, any ideas on how to pass the time? Why'd you do me like that, bud? What have you done with Hiccup? The sooner you tell us where Hiccup is, the easier it'll go on you. I'm telling you, he's here. Sure he is. I've had enough of these lies. You're alive. Wait, you're alive? and you're teaching him to ride a dragon? Yeah, it's a funny story, actually. and he sailed off in the other. So, Dagur saved your life? -Why didn't you tell us? Yeah, why didn't you tell them, brother? ..because I wasn't sure how I felt about it. To be fair, I have done some pretty questionable things. Questionable? Trying to kill us is not questionable. Yeah, yeah, yeah. He saved you. I get that. But why are you teaching him how to ride a dragon? Dagur, have we got some good news for you. Fishlegs here is the best Gronckle trainer in the world. He can help improve your flying. -Maybe you should go train him. -I don't think he can hear us. I want to know everything. Everything! Eight ships being worked on at once. we could cripple Viggo's fleet. Could we talk about the Rumblehorn in the room, please? I know. know. But he seems like he's really trying to change. right as were about to hit Viggo's shipyard? but he helped us escape. so they could put a spy among us? Look, I'm not blind to the risks, Astrid. least dangerous dragon I could find? Toothless let Dagur ride him to save me. then I have to try to trust him, too. Well, I hope you and Toothless are right about Dagur. see how he and Fishlegs are doing. OK, but just to be safe. I have an excellent teacher. Look at this move he came up with. We call it the Inverted Gronckle Drop. We could really use it on our next mission. I think that's enough training for you two. But there's hours of light left! And I have so much to learn. She obviously doesn't trust me and wants to check me out for herself. Oh, hey, he's not as dumb as he looks. And now she's trying to provoke me. I am the sea, calm and wide. -Try not to hurt him. Probably better than Snotlout could've done it. Use loops to keep the sun behind you and in your enemy's eyes. -You'll be harder to hit. I really am trying to change, Astrid. I will personally make you pay. She's just trying to make a point. He was ready to defend you after one day. But seriously, turn on us and I will send you to Valhalla myself. This is the Reverse Tuffnut. This, the Double Twist Tuffnut. -Did you name all these moves yourself? -Are you going to tell Dagur about Heather? You heard her last night. She clearly isn't ready to see him. Well, then you better get him off the Edge. She could be back any minute. Yes, I know. Why do you think I'm teaching him how to fly? -Get who out of here? I think I know who lost. I guess a hug is out of the question? Hiccup Haddock, I cannot believe you kept my Heather from me. Was she alive? Was she dead? Oh, please. Drop the act. And you! It's bad enough that you were consorting with my mortal enemy. I think that means they're dating. But then you teach him how to ride dragons? Heather, he saved my life. I don't care. You can't trust him. before this mission? It's a set-up, Hiccup. To be fair, that was my first thought, too. He set me adrift as a child. He killed our father, for Thor's sake. He tried to kill each of us multiple times. but I am trying to change, sister. Don't ever call me that, spy! I don't know how I could possibly prove that. I guess you're just going to have to take my word for it. Yeah, I don't think I would take it either if I were you. but I think Shattermaster and I should be going. Good day. Oh, come on, Dagur. Dagur. Yeah! Tears of laughter, at us. I should probably talk to him before he goes. Everyone kept dropping hints about some big mission. I thought I should take a look. but I do not want her flying any suicide missions. Viggo is retrofitting his ships. Enlarging the sails for bigger dragons, it looks like. Deep behind his lines and shrouded in fog. It seems a little too easy. We've kept an eye on it for weeks. Viggo doesn't defend it because he doesn't think we know about it. but staying just up out of arrow range? That's your problem. I should know. I tricked you plenty of times. Yeah, well, I'm still here. So you ARE a spy! I was just trying to talk some sense into your boy Hiccup, here. We can't let him go now. Then go do your mission. I'll hold you personally responsible. We'll figure out what to do with you when we get back. Did the number of ships at that shipyard just happen to go up? Uh, yes. From 8 to 12. Because eight ships wasn't enough to draw you in. I am. And you know what? It's telling me not to trust you. You're on guard duty, chicken. Keep an eye on this guy. Dagur couldn't be right about this mission being too easy, could he? We've been watching these shipyards for weeks. We haven't seen anything out of the ordinary. Dagur is still working for Viggo. He was just trying to keep us from attacking his master. He's a liar and a spy. You have to admit, he really has bonded with his dragon well. to give away our plan. Maybe we beat him here. This is your last betrayal, Dagur. You can't lose me that easily. Even when he warns them, they'll still need time to react. We have to hit the shipyards now! I have a message for Viggo. Tell him Dagur the Deranged says, "Hello." What does he think he's doing? That it was a trap all along. Let's show them what a real rider and his dragon can do. Come on! We have to do something. He knew it was a trap and he still flew right in. I will never forget his noble sacrifice. You think my brother sacrificed himself? He thought he could make it. I just never heard you call Dagur "brother" before. "Heather, if you're reading this, I guess that's bad news for me." "Sorry, but I couldn't let Hiccup fly you into a trap. "hit his next dragon auction. "some worm will tell him where it is. "I didn't kill our father. "so they would think I was tough enough to be chief. "I did a lot of things I'm sorry for. "But I couldn't rest in peace knowing you thought I did that." "Be safe. Your brother, Dagur." When Dagur comes to Dragon's Edge looking for Heather, Hiccup tries to keep the two siblings apart by teaching Dagur the art of dragon riding.